The true epiphyllums are relatively modern plants in evolutionary terms. Almost all of the epiphyllums grown and offered for sale today are hybrid descendents of jungle cactii found in the tropical new world. The plants were introduced to England in 1753 and many hybrids were propagated in England, Belgium, The Netherlands, France and Germany. Ironically the hybrids were reintroduced to North America from Europe in the late 1800's. 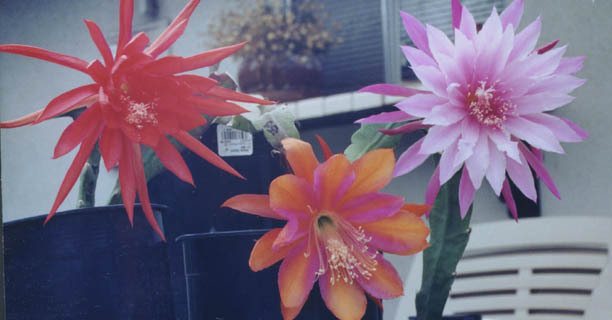 The fine climate of Southern California has resulted in that area becoming the major center of epiphyllum culture at this time. The ESA (Epiphyllum Society of America) is the international registrar for Epiphyllum hybrids. The society maintains a directory of hybrids that is available for a very nominal fee. Anybody having more than a passing interest in epiphyllums should consider joining ESA or one of the regional clubs for the support available and to form acquaintances with people sharing their interests. The native habitat of the original species is decomposed leaves collected in the hollows or cavities of jungle trees. That should tell you a lot about the plant's preferences. They need the filtered sunlight which is why they do well under trees, in lath houses and under shade cloth. The roots like to be moist but not wet. The plants should have a soil approximating the jungle environment and they should have good drainage. Most of them, particularly the flat branched ones, do very well in hanging baskets. The hybrids are not normally nocturnal or diurnal blooming as many of the true species are. Most of them have some fragrance at night and depend on color to attract pollinators during the day. The hybrid flowers are wonderfully beautiful, and have few rivals in cultivation. Depending on the variety, the flowers last from 3 to 7 days. Of course, that represents an obvious target for any wannabe hybridizer. They generally bloom in April through July, but there are early bloomers and late bloomers. This is another obvious hybridizer's target. Some work has been done on developing indoor plants, although that has not been the main focus. All of the relevant organizations, including ESA have regular shows that include some flower arranging. A hybrid that could compete with orchids for use in corsages would be welcomed by any grower. There you have it. A plant that is easily cared for and produces flowers of unparalleled beauty. The epi is it's own reward and you will be an aficionado after your first one blooms.